1. 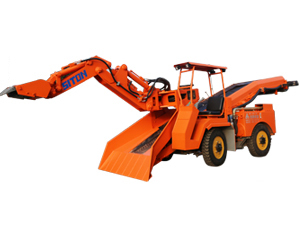 The conveyor of this wheel mucking loader or wheel haggloader can discharge the rock into the auto dumper, Shuttle Mining Car, side-dumping car, belt conveyor, skip and other transshipment equipment. 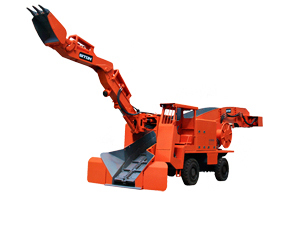 The dumping height can be designed according to the requirements of customers. 2. By adopting the fully hydraulic transmission of motor-driven, this wheel tunnel excavator has the functions such hydraulic walking, drilling and collecting, transport, and loading. The working surface will be cleaned automatically by itself. 3. By adopting the manual operated valve, the wheel mucking loader can be operated easily. With a seat and cab, the intensity of work can be alleviated. Its driving force includes dynamo and diesel. 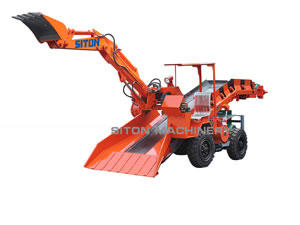 Founded in 1992, Siton machinery manufacturing Co., Ltd., is a professional wheel mucking loader (wheel haggloader) manufacturer in China. Our products include hydraulic crawler drilling jumbo, Shuttle Mining Car, mucking road header, fully hydraulic side dumping rock loader, track concrete mixer, side dumping wagon, belt conveyor. We have obtained the security certificate and the patent certificate of national grade. Possessing more than 60% market share, our products are well received in Canada, India, Kazakhstan, Vietnam, Morocco, Algeria, Laos, Nepal, etc. If you are interested in our wheel mucking loader, please contact us freely.